I love the IHSA Track & Field State Finals. The best athletes from all three classes gracing EIU with their super-human talents all in one day. The stories and the drama unfolds in a series of three-act events as we compare the 1A times to the 2A and 3A times, and we root for the dark horses in outside lanes and collectively gasp and turn from the finish line to the scoreboard to see the jaw-dropping times thrown down from lanes 4, 5, and 6. In the back of our minds we keep tabs on team scores, but the real show lies in the individuals racing each other, the clock, and the record books. Indeed, for all but about a half-dozen schools, the possibility of taking a trophy home from Charleston is a fantasy. True Cinderella teams (think NCAA MBB Loyola in 2018) don’t exist at the State Finals. Announcers talk about “scoring chances”, and prognosticators have mathed out what needs to happen for each team, but aside from a few key events, the head-to-head high-stakes events like we see in other team sports’ finals just don’t exist. The one drawback of our otherwise fantastic State Finals is that we do not reward the best ‘team’ in the class, but rather the school with the most superlative individuals. A simple case study (and admittedly unsatisfactorily small sample size) of the 2018 Class A State Finals show that the third place team, Rushville Industry, competed in four events, the second place team, Rockford Christian, had entries in nine, and the state champions, Ridgeview-Lexington only participated in six of the eighteen events in finals. Coach Benton is a talented coach and friend of mine, and his Mustangs won the meet while participating in less than half of the events on Saturday. The top three teams only went head-to-head in five events, and NO events had all an entry in Finals from all three teams. There have been numerous times when a single person has scored in four individual events and taken home a “team” trophy on their own superlative talents (Kristin Owens won the team title for Tri-Valley in 1998, for example). I do not say this to take away the titles and accomplishments of those bringing home team trophies from State Finals, and indeed, this is how championship track meets are scored and won across all levels from Junior High to NCAA. The current system functions perfectly at crowning the best individuals and rewarding the schools who develop the most podium athletes, or at least a few top-of-the-podium athletes. I bring it up to suggest that a second State series should be developed to measure which school has the best true team- as a way to turn all 18 events into the high-stakes, head-to-head match ups that Track & Field deserves. 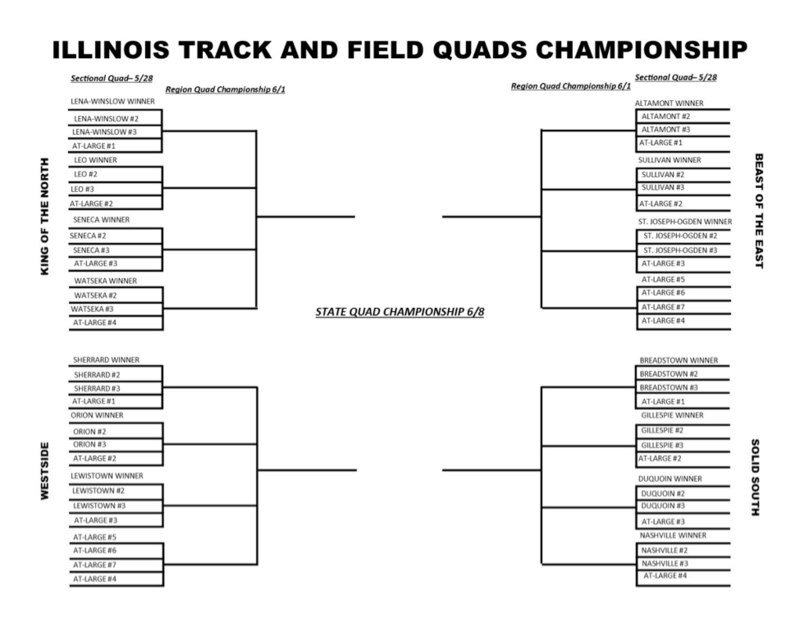 The goal of the Illinois Quads Team Track & Field Championship would be to reward the best all-around Track & Field program in each class and to showcase the team nature of Track & Field, currently downplayed by the current State Finals system. Meets would take on a real playoffs feel as an “us v them (and those guys and the other team)” narrative makes each event and each place a factor in the outcome of the meet. The series would slow the meets down to allow the 4×8 guys a chance to actually go out and see their discus teammates, to surround each event as it took place and cheer teammates to those all-important 4th and 5th place points. In addition, quality programs that develop excellent athletes in all disciplines will be rewarded even in the years they do not have the genetic freaks that allow them to factor into the individual State crown. This format would allow for time to hype team scores and next event entries, but keep the meet moving. With scoring following the NFHS rules for four-team meets (6-4-3-2-1 and 6-4-2) team scores would be excitingly close and outcomes will be based on a nice balance of superstar talent as well as depth in all events. Each team will be permitted two entries per event, but lineups could change for each of the three meets in the series. Match-ups, entries, and race strategy will take on a whole new level of significance as times will mean relatively little compared to places in regards to the outcome of the meet (and negating the necessity of FAT, although it would still be encouraged). Logistically, the entire Quads Series format could be done in a 12-day and three-meet series (Tuesday-Saturday-Saturday) at the conclusion of the current IHSA State Series, culminating on the second Saturday after the current IHSA Track Finals (June 8th in 2019, same Saturday as 3A and 4A State Baseball Finals). With the Final Four teams meeting at a central location for one final Quadrangular meet to crown the Team Champion of Track & Field. To qualify for Quads, a team would need to place in the top three in their current IHSA Sectional, or be one of the four to seven at-large teams per region selected by vote at the current IHSA State Prelims (and announced on the Saturday of Finals). Some brackets will be stacked, some paths to the Final Four will be easier, but this only adds to the anything-can-happen magic that makes the Quads Series so exciting for track fans. How about limiting the number of events an individual can enter down to 2 or maybe 3. By that time of the year the ” race horses” have been ridden pretty hard for 3 weeks. Maybe that would be more of a team event that is not just highlighting the elite talent, but the depth of a program.